Our Intake Manifold Upgrade Kit enables your engine to produce more horsepower through increased boost pressure (+1lb). 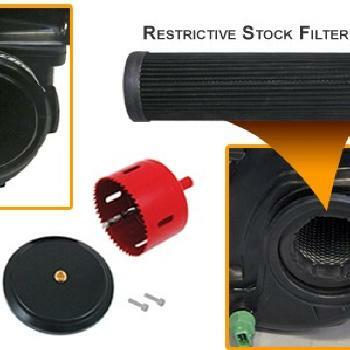 Supplied hole cutting tool allows easy removal of restrictive screen element from inside of intake manifold. Special o-ringed, billet block-off plug with integrated fitting for aftermarket boost pressure gauge fills opening left after removal of screen element. Includes detailed installation instructions. NOTE: Our testing has determined the stock ECU will compensate for the increased boost provided by our Intake Manifold Upgrade Kit.